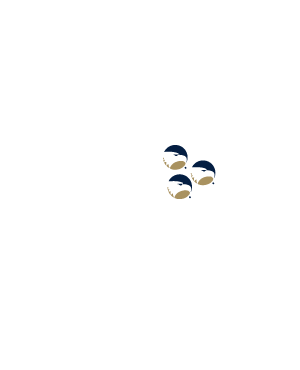 Gold for Blue offers our students the opportunity to upgrade their dining plans for FREE. With such a high demand for this exclusive offer, Eagle Dining Services has opted to EXTEND this special offer for a limited time. Upgrade today! 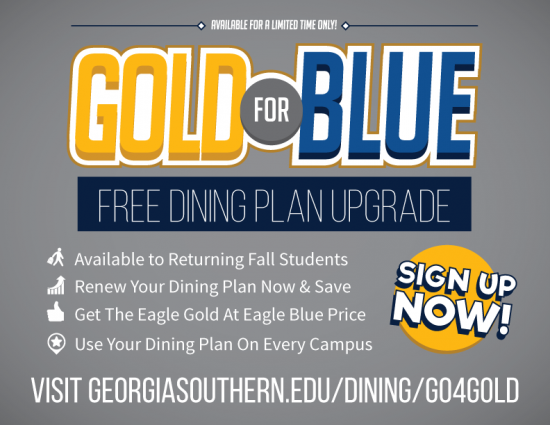 Eagle Dining Services is offering returning students on both the Statesboro and Armstrong campuses the Gold for Blue dining plan deal beginning April 9. This offer allows students from both campuses to purchase an Unlimited Gold dining plan for the price of an Unlimited Blue. With the Unlimited Gold plan, students will be able to acquire three more guest passes as well as 200 more Dining Dollars. Students who sign up during the promotional period will receive a free EDS t-shirt (while supplies last). “We are excited to offer this opportunity every year to students. We work tirelessly to ensure that students enjoy their dining options on campus, and this serves as a thank you from Eagle Dining Services to all those who renew their dining plans,” said Greg Crawford, the director of Residential Dining at Georgia Southern. Eagle Dining Services works constantly to accommodate students wants and needs regarding dining options on our campuses. Menus and stations in both Dining Commons and Lakeside Dining Commons are constantly being adjusted and molded to fit what students ask for. So don’t miss their next big change by purchasing a dining plan today. This opportunity is only available until for a limited time, so make sure to take advantage of this amazing discount before it’s too late. Visit GeorgiaSouthern.edu/dining/go4gold for more information.